Alyssa was amazing at our wedding! She provided the extra little touch of perfection to our day. What a professional! Very punctual, had great recommendations, and was great at her craft. 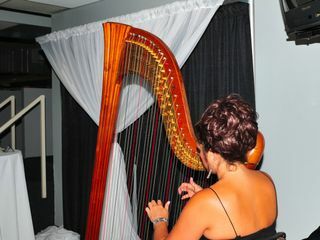 Would definitely recommend Alyssa and Divine Harp if you are looking for that extra piece of elegance at your wedding. Thank you SO much Melissa! Your wedding was fabulous, and the guests were so much fun to interact with and take requests from! 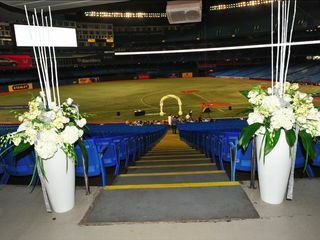 It was my pleasure to play at the ceremony and then after for the cocktail reception. That huge photo mirror was a great touch! Alyssa is professional and plays harp with such elegance and grace. Her talent stands out above all. She gave us a large variety of song choices that she effortlessly performed and customized to suit our needs. Her performance had brought goosebumps to all those in the room. Will always be truly grateful to have been blessed with Alyssa's talent to set the romance and mood for my Wedding Ceremony and Signing, making my most amazing special day that much more special! I am truly grateful! One can only be so lucky to have Alyssa perform on your special day! What an amazing day! Thank you so much for your compliments and I won't ever forget that day - that was my first "live" broadcasted wedding to your friends that couldn't make it. Truly sensational. Thank you for having me be a part of it. 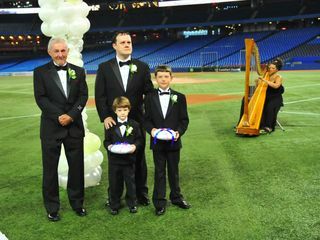 Our wedding was magical but it was truly majestical with our harpist that made our wedding vows in a word perfect. 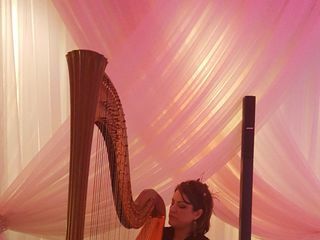 There's something that makes your love flow when you have harp music playing behind both of you. Make your treasured memory never to be forgotten and I highly recommend for couples that wish to make the day...truly defined as perfect. It was such a pleasure to be there for you two on your special day! Thank you for inviting me to stay for the marvelous dinner after, and your kind words here warm my heart. Thank you from the bottom of my heart and all the best in your new future together! Alyssa is a very talented musician and added so much to our daughter's special day. Would highly recommend her to anyone wanting special music at their wedding. Our guests have not stopped talking about how beautiful the music was. I was asked by dear friends to work with Alyssa to select muisc for their outdoor wedding ceremony in a stunning private garden in Paris, ON this summer. Alyssa was engaged by a wedding planner to play before the ceremony, during the signing of the register and at the recessional. Initially, I went on her website, viewed her extensive repertoire listings and listened to some of her recordings. We liaised by email and determined most suitable selections. She played everything masterfully and wth great feeling while showing flexibility to ensure that pieces extended to just the right moment. She is a delightful person with whom to work. I have no hesitation in recommending her musicianship and personality!! 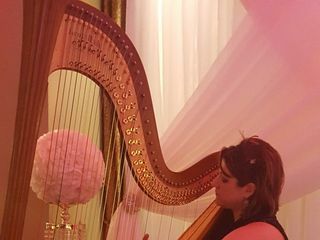 We had Alyssa play the harp at our wedding this summer. She was so sweet to deal with and responded quickly to any questions I had. I let her have full control of the music selections that day and she did not disappoint - it was beautiful. Highly recommended! Alyssa came up as one of my searches when I was looking for a harpist. 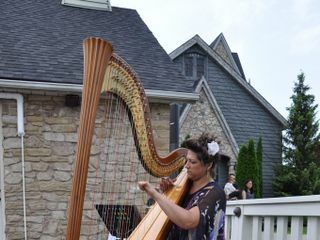 She was one of the quickest to respond, and was also the only one willing to accommodate a special request of mine - to allow my brother (also a harpist) to play a song on her pedal harp during our wedding. Several of my guests have even came up to me to compliment on her performances. Overall, I am rather pleased to have hired her. 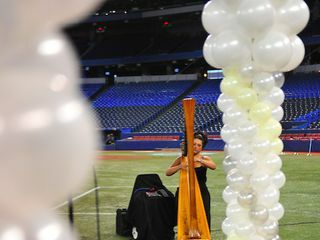 Alyssa played at our wedding on the field at The Rogers Center. It was pure luck that we found her, and we thanked our lucky stars that we did. She was wonderful, so professional, dressed so beautifully, not to mention that she is a very talented musician. Her harp music was almost angelic. We decided to let Alyssa make most of the musical selections for the ceremony and reception and each one was beautiful and appropriate . Couldn't have been happier with the whole experience.